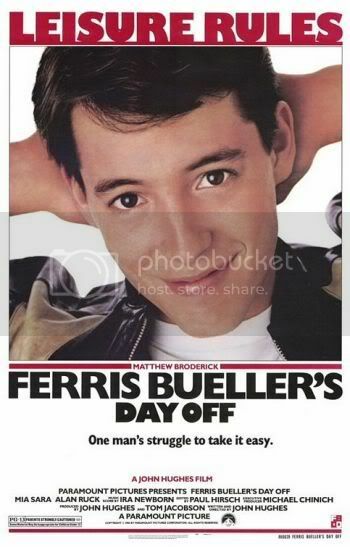 Ferris Bueller’s Day Off has become a classic, the epitome of 1980’s teen comedies. For one day, during school, Ferris Bueller (Matthew Broderick) manages to live out nearly every high school kid’s fantasies. To carry out his schemes he must go through nearly as much planning as the Allied POW’s in The Great Escape [review here], and while the payoff might not be as dramatic in this film, it will speak volumes more to each generation of high schoolers. Ferris is aware. He is aware of how the world works, how his parents work, how the school system works. And he’s aware that he’s in a film, or at least pretends it’s a video journal, as he breaks the fourth wall at key points to describe what’s about to happen and how. His first step is to trick his parents, who seem to genuinely care but are naive, into thinking he’s just sick enough to stay home but not sick enough to go to the doctor. This entry was posted in 1986, 3.5 pirate flags, 3.5 stars, F, Movie Reviews, Pirate Flag Rating, Star Rating, Year on February 8, 2011 by Tim Irwin.